Due to the interest and high volume of readers in my blog post "Birthmarks and Laser Treatments", I asked my mom (Rhonda Hodges) if she would be willing to share her perspective of having a child with a physical difference. Her story is below. PS: If it looks familiar to some of you, a shorter version was published in the Free Will Baptist "ONE" Magazine several years ago. This is the longer and updated version that rooted from an English assignment while she was in college. She’s here! She’s finally here! As the doctor hands her to me for the first time, I am filled with emotion. As I count her fingers and toes, I count my blessing also. She is a gift from God and she is beautiful! No one will ever change my mind about that fact! 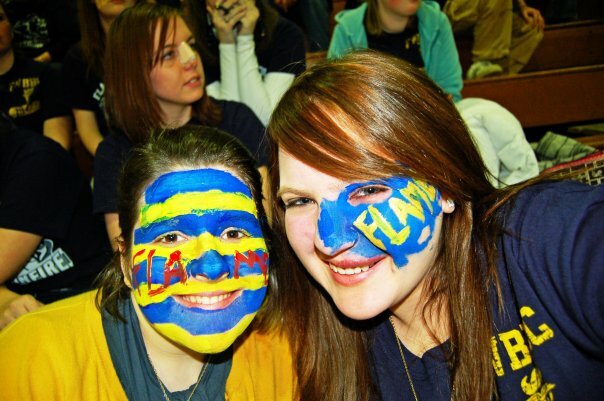 My attention is drawn quickly to the color of her face. Something is different, but I am too tired to figure it out right now. Her daddy takes her and gives her to the nurse so she can weigh, measure and clean her up. He, too, notices something different but is not sure if it is because she is a newborn. After a pediatrician examined her, he comes in to talk to my husband, Jim and me. 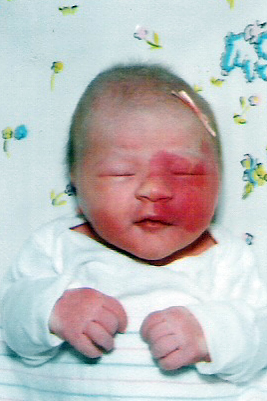 Crystal has a port-wine stain (vascular birthmark) on the left side of her face. As the name suggests, the birthmark is a deep red, almost purplish color. He is so blunt and doesn’t seem to care about what we may be feeling and thinking at the time. We were expecting a healthy, “flawless” baby. We bombarded him with questions: Will the birthmark go away? Are there other side affects? What caused it? What did I do wrong during my pregnancy? 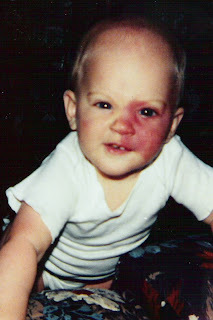 The fact is that more than 10 babies in 100 are born with a port wine stain birthmark. Only a small percentage of these are located on the face. This type of birthmark is formed from extra blood vessels under the skin and it does not go away on its own. In fact, the birthmark will probably get darker as the person grows older. While there are different types of laser treatments to lighten the stain, they are not always effective. The birthmark goes deeper than the skin you see. In the case such as Crystal’s, it can also go into the brain. When the doctor talked with us after Crystal was born, we learned that if the birthmark went too far into the brain, she would suffer a seizure within 24 hours of her birth. Sometimes, the child has brain damage from the birthmark as well. As the first 24 hours of her life came and went, we were relieved that no seizure came. This meant the news was good – it was not very deep into her brain. Since the location of Crystal’s birthmark is over her eye, there is also a concern about her eyesight. In most cases, glaucoma is diagnosed later in life. For Crystal, this meant she would be diagnosed with glaucoma at the age of nine. While others look at her differently because of the outward stain, her view of life is different from what most people realize. The slight loss of vision she experiences at such a young age makes her keenly aware of the importance of seeing what’s really important – the inside of a person. The causes of this birth defect are unknown. However, it is certain that the mother did not do anything wrong during the pregnancy, but this documented fact does not prevent her from feeling the guilt that she somehow caused this on her child. I spent many, many nights wondering what I could have done differently to prevent this from happening. It has taken years for me to accept my innocence. Another question that arises is how society will accept this child that looks different. How will they treat her? This question was answered for me just a few days after her birth. As soon as I was able, I went to church to show off our wonderful daughter. A well-meaning older man of the church whispered to his wife, “Did you see her face?” As an older gentleman, his whispers are much louder than he realized, and I heard the remark. Several weeks after this, I went to the mall with my family. My sister, Felicia, was holding Crystal.While we were in a toy store, a man came up to my sister and said, “How did you burn your baby?” She did not correct the fact that she was the baby’s aunt, but rather explained that it was a birthmark – she wasn’t burned. This was the most offensive and brutal comment that I remember hearing. How could someone go up to a complete stranger and ask such a personal and horrifying question? Why did he focus on her imperfection rather than the gift we received from God – our baby! During this same visit to the mall, my other sister, Joanna, was holding her. A lady seemed to have come from nowhere, came within a foot of Joanna’s face and said, “What’s wrong with your baby?” Joanna was surprised at this woman’s boldness. She stepped away from the woman and promptly told her that nothing was wrong with her baby, she just had a birthmark. She wanted to ask the woman what was wrong with her, but restrained from being as rude as the woman had been. Amanda and Crystal - The two sisters together. As can be expected, our family has always tried to protect Crystal from these cruel and thoughtless questions and comments. Even her sister, Amanda, has tried to protect her from the stares and comments. Amanda is seven years older than Crystal. I never realized that she was so worried about how people perceived Crystal until the day when our family went to a hardware store. We were standing in the checkout line, and Amanda noticed the clerk staring at Crystal. Without the clerk saying anything, Amanda blurted out, “It’s a birthmark – only a birthmark!” When I asked her why she did that, she said that she gets tired of people staring at her sister because she looks a little different. As mentioned earlier, there are many different types of laser treatments that have been successful in lightening the stain. During the first seven or eight years of her life, Crystal had approximately 14 laser treatment surgeries - we lost count. While the surgeries lightened the birthmark some, it did not remove it. When the surgery is done, the skin is discolored even more and darkened immediately. The job of the laser is to go below the skin and cause the blood vessels to be cauterized. This process causes the area to be swollen and appear bruised. The additional discoloration will last about two weeks, and when that is gone, the birthmark should be lighter. you should see her father. As one can imagine, we were even more protective of our young daughter after she had the laser treatments. When she was just a baby, she had surgery in San Francisco. On our way home after the surgery, my husband and I decided to stop for dinner. As we entered the restaurant, my husband said, “If someone says anything about her, can I hit them?” Even though I chuckled at his comment and told him “no”, I secretly wished we could do just that whenever anyone made rude comments about her. As Crystal got older, the surgeries became less effective. When she was 11, we decided to let Crystal decide if she wanted to continue the treatments. She decided she did not want to go through them anymore. Just recently, she decided to start the treatments again. Over the past ten years, technology has improved the laser machine and after her first treatment, her birthmark is already lighter. Even though she is a young adult, I still feel the need to try to shield her from the stares of strangers after her treatments. I even find myself “staring them down” or even trying to block their view if I see that someone is staring at her. I realize that’s a bit silly and maybe even funny, but I suppose it’s because I don’t want her to be hurt. When the world looks at Crystal, they see a young lady with a mark that cannot be hidden. Even though our society is supposed to be more learning about those with physical differences and disabilities, the stares continue. Crystal and some of her friends at school. Most of the time, it’s adults that are the most inconsiderate. Usually, children will look at her for a minute and continue on their original mission. Occasionally, one will ask her a question about her face. She will tell them it is a birthmark, and their curiosity is satisfied. When she was in grade school, the children in her class asked many questions. When she explained that it was a birthmark, the children either showed or told everyone about their own birthmark. Life continues for them as if nothing is different. Those that look different – whether caused by an accident or at birth – are often perceived as not mentally bright. The thought is if someone doesn’t fit the typical mold, they must not be as smart as others. This simply is not true. I always teased my children about having eyes in the back of my head. They often tried to find them, but I told them that they were only used when they were needed. When Crystal was about five or six, I was in the kitchen preparing dinner. She came into the kitchen behind me and wanted me to look at something she had in her hands. I told her that if I turned around right then, I’d cut my fingers. She said, “See, Mommy, I knew you didn’t have eyes in the back of your head.” While her response was comical, it also showed her ability to analyze things at a young age. Our friends from church or those that are around her a lot no longer see Crystal’s birthmark. They see Crystal. They even forget she has one until we ask them to pray for her during an upcoming surgery. When surgery is mentioned, they have to stop and remember why she is having surgery. This forgetfulness doesn’t happen because the birthmark is too light to see, but rather because they know Crystal personally and are focused on her personality. At times she can be shy, but most of the time, she is an outgoing young lady. She can be very dramatic and grew up loving to be the center of attention! Even as her mother, there are many times, that I can’t remember what side her birthmark is on. When I would call to schedule a doctor’s appointment for her, I have to look at her picture to remember where it is located. I criticize others for their lack of acceptance of my daughter as she is, but I also have had to reprimand myself. There were times I needed to reevaluate my reasons for scheduling her laser treatments. Is it because I want what is best for her, or am I pursuing it so I will no longer have to explain her appearance to others? shown through her style of humor. In order to help those that have this type of abnormality or those that have been burn victims, a special makeup has been developed. We purchased some of the makeup for her when she was 11. Normally, I don't encourage kids that young to wear makeup. However, due to this different situation, we decided to let her try it to see if it made her more comfortable around others. The texture and thickness of the makeup is very different from regular makeup and after trying it a couple of times, she decided it wasn’t worth the work. I’m actually really glad she decided not to wear it. Her decision just shows the strength she has and her positive self-esteem. In fact, she didn't even start wearing "normal" makeup until she 17-years-old and was a senior in high school. Most people judge others by what they look at rather than who they are. There are many other types of prejudices in this area rather than the port wine stain like my daughter has. Let’s look at those that are too heavy. If someone is too heavy, we typically think that they are lazy and sit around all day doing nothing. While this may be the case, it is not always true. Many of these people have tried one thing after another to lose the extra weight, but nothing has helped them. While they may never be happy about the extra weight, they learn to accept themselves the way they are and be happy, successful people. On the other end of the spectrum, we think that those that are too thin must be sick or have an eating disorder. After all, how else can they stay that skinny? Just as those that try to lose weight without success, many thin people try to gain weight without success. Their experiences in purchasing clothes can be as frustrating to them as to the overweight person. It’s no fun for a businesswoman to have to look for business attire in the junior section of the clothing store. Those clothes are made for teens – not successful women. In addition to weight perceptions, we look at those that have acne. When we see someone that has severe acne, our minds tend to think that they don’t take care of themselves the way they should. We forget about all of the medicines or overactive glands that can cause this condition. Unfortunately, there are many other “stains” in life that cause us to judge others by their looks. By limiting ourselves to those that appear to be “stain” free, we miss many blessings. 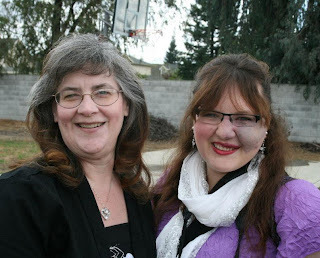 At one time in our church, we had two young ladies that are mentally challenged. One is a Down’s Syndrome child, and the other one has other mental disabilities. When I was younger, I would steer away from these girls because they are “different”. I even remember a time before Crystal was born when I saw someone at a store that had a birthmark and was thankful that Amanda did not have their abnormality. I remember feeling sorry for that woman and wondering what caused her condition. No, I didn’t go up to her and ask her these questions, but I still looked at her as someone with a “stain”. I together on Easter, 2013. My attitude has changed dramatically. Maybe it's because I have a daughter who has a birthmark that everyone can see or maybe it’s because I’ve matured. The reason seems unimportant. The important thing is that I have learned a tremendous lesson. By judging people by what they look like, we are limiting their abilities and importance. If we keep ourselves from getting to know these beautiful people, we are missing out on receiving blessings in store for us. We all have “stains” in our lives that are not attractive. How do we use those? Do we try to hide them from others and try to forget we have them, or do we learn from them and try to help others? That is the question we must each ask ourselves. Be sure to answer it honestly. This is beautiful beyond belief. I love this so so so very much. What a wonderful mother, who no doubt instilled in Crystal a great sense of love and self-worth which helped her become an amazing woman! Thank you both for sharing this. Thank you for sharing this. I am a mother of a 3yr old with a brown birthmark on most of the right side of his face & my biggest concern is how others see him but after reading this I've realised that as long as I teach him to see the good in everyone, what people think of his birthmark won't matter. You've been raised by an inspirational woman. Please thank your mother for sharing her story. My beautiful four year old also has a port wine stain, and I am always looking for parenting resources to equip her to be as amazing as God created her to be. Thank you for offering a glimpse into your parenting journey.